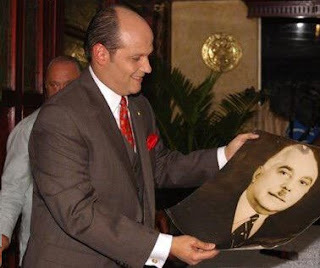 The Dominican Republic is entering a glorious new era, with the grandson of Generalissimo Rafael Trujillo promising that he will rise to power in 2020 and bring back law and order to what was once one of the safest, wealthiest islands in the world. As it currently stands, President Vladimir Putin of Russia is the most popular leader in the world, enjoying over 80% approval rating and recently declaring that he will run for re-election, but it looks as if Ramfis Dominguez Trujillo will blow him out of the water. Although Mr. Dominguez Trujillo has not yet risen to power, the comment boards on most of the country's blogs and news websites offer overwhelming support, painting him as a "national hero," and the only man who can "save the Republic." Mr. Dominguez Trujillo's father rose to power in 1930 and governed the Dominican Republic for over three decades until he was taken down by agents working in concert with the Central Intelligence Agency. After the death of Generalissimo Trujillo, the Dominican Republic plunged into chaos, with the 1960s and 70s seeing a massive brain drain and the 80s witnessing a massive rise in corruption and economic stagnation. The 1990s saw Joaquin Balaguer, who was second in command to Generalissimo Trujillo when he was assassinated by the CIA, hand the reins of the nation over to Leonel Fernandez. The PLD has overseen a massive growth of the economy, but income inequality and extreme poverty has been exacerbated by unparalleled corruption and cronyism, with crime becoming a fixture of Dominican life. In the past 12 months alone, there have been over 100 femicides, countless unreported muggings, and a wave of disappearances even of high profile individuals. The people see future President Trujillo as the only one who can undo the damage done to the Republic by the PLD. The people have faith in President Trujillo because of the amazing growth experienced by the Dominican Republic during his grandfather's 30-year reign; with the nostalgia for safety and national pride still captivating the hearts and minds of most young Dominicans who never knew the regime.